There's no dictionary, geographic mapping or flow chart tool baked into the core Microsoft Office 2013 software, but you can still get all these functions for free or a small fee. Developers from Microsoft and beyond have created a variety of apps that you can embed within Word, Excel, PowerPoint or Outlook to work faster and more intelligently. browse featured and new apps and find apps by Office program. Task pane apps typically provide reference information, such as a dictionary. They're supported by the 2013 editions of Excel, Word, Project Professional and PowerPoint. These apps open a task pane on the right side of the current program window, where you work them. Content apps are supported by Excel 2013 and the Excel Web App only. They are embedded inside your worksheet and saved with it. Examples are a calendar date picker or additional charting designs. Mail apps are supported by Outlook 2013 and the Outlook Web App, and they require you to be using Exchange Server 2013. Mail apps won't work with POP and IMAP email accounts, so they're effectively limited to business use. Mail apps display next to an item in Outlook, such as an email message or a meeting request. They access data from the Outlook object to provide additional content—for example, a map showing the location of a meeting. Additional apps are compatible only with SharePoint Server 2013 Enterprise edition. Here's the Apps for Office button in Word's Insert tab. Click the Insert tab from within your Office application, then click Apps for Office, See All. A dialog will open, showing My Apps and Featured Apps. In Featured Apps, you can click More Apps to open a browser window leading to the Office store, where you can see the apps available for the program you’re using. Or, you can go directly to the Office Store. Here are 10 apps to check out now. Insert a date or the current time into a cell in one click. Need to enter dates into your Excel spreadsheet over and over again? This app embeds itself within a worksheet and pops up a calendar that you click on to insert a date or time into the currently selected cell. You can set your own week start date and color scheme, and enable or disable week numbers. You can do a free trial for this $1.99 app. The apps buying process needs work; after we purchased the app, it still described itself as a trial version. However, the developer was quick to assist when we reached out. Get an instant layout for a range of Avery printable papers. Not a paperless office? If you ever print address labels or name tags, then get this free app for Word 2013. This task pane app lets you search for printable Avery products and create a document based on each one. This spares you from having to search for a suitable template or creating one from scratch, for example, labels using the Mailing labels feature in Word. Word 2013 doesn’t ship with a dictionary, so you'll need to add your own. Surprise! Microsoft Word no longer ships with a dictionary, so you'll need to find one on your own. There are a few dictionary apps in the store, but the free Bing Dictionary for Word and Excel 2013 offers convenience detail. It provides a small amount of information in the task pane. You can click See Moreto view more information, including sample sentences for context. This freebie installs into Outlook 2013 and the Outlook Web App. 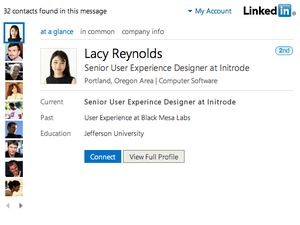 It provides details of your LinkedIn connections, groups, profile information, and recent activity. If you are using the Outlook Web App you will need also to be using Internet Explorer 9 or later, and Windows 7 or 8. If you can't access this app because your email isn't handled by an Exchange Server, don't despair; its functionality is similar to that of the Outlook Social Connector that's already built into Outlook 2013. Simplify making calculations within a range of Excel data. This free tool performs calculations, such as multiplying or dividing a range by a value, or adding a value to or subtracting a value from a range. It can also add percentages to or subtract percentages from a range. While you can do this using Excel Paste Special options, it's neither intuitive nor easy for beginner users. This app lets you select the range, the type of calculation, and the value to work with, and then it does all the work. When you click Calculate, it warns you that formulas in the range will be overwritten with values after processing. At that point, either click Yes to continue or Cancel to exit.